mouth impressions drive at least 5x more sales than paid ad impressions, and up to 100x for highly planned purchases. Further, consumer conversations drive action immediately—within 2 weeks of purchase—much closer to the purchase point than conventional media. Together, online and offline word-of-mouth account for 13% of consumer sales, which represents $6 trillion in annual consumer spending. This follows a paper by Professor Wendy Moe of the University of Maryland over the summer that found a significant .8 correlation between social media listening data and brand equity metrics derived from survey questions. As Joel Rubinson points out, the two studies together demonstrate word-of-mouth offers not just data power but also prediction power. “If the data has predictive value, it should be hired!,” he says. Those with a stake in different tactical approaches often champion either offline or online media as the best method to drive word-of-mouth. Offline is more established, yes, but online is faster growing. Both are right. But in a contest over influence, it’s not close, it’s a rout. Keller Fay demonstrated that 9 out of 10 brand mentions are face to face rather than via social media. A study in the Journal of Marketing Research takes this further, showing how categories vary. For example, media, cars, and technology have a larger percentage of word of mouth online. However, food, beverages, beauty, clothing, kids products, financial services and more dominate offline. How to make word-of-mouth happen is the single most important question. It can’t be bought or flighted like traditional media. Robbin Phillips and her colleagues wrote a book on the subject. Brains on Fire, a guide to creating powerful, meaningful, sustainable, word-of-mouth movements, argues the first lesson is to focus on people instead of tools like Facebook or Twitter. In her blog, Phillips questions the conventional approach of using fans to spark word of mouth referrals. A new bank called Simple personifies this approach. Focusing on people is the start. Next is realizing that “Likes” don’t lead to advocacy. Getting people to talk starts with getting people to love your brand. Word of mouth and advertising are not opposing sides. They are on the same side. Bigger media buys yield more conversation. 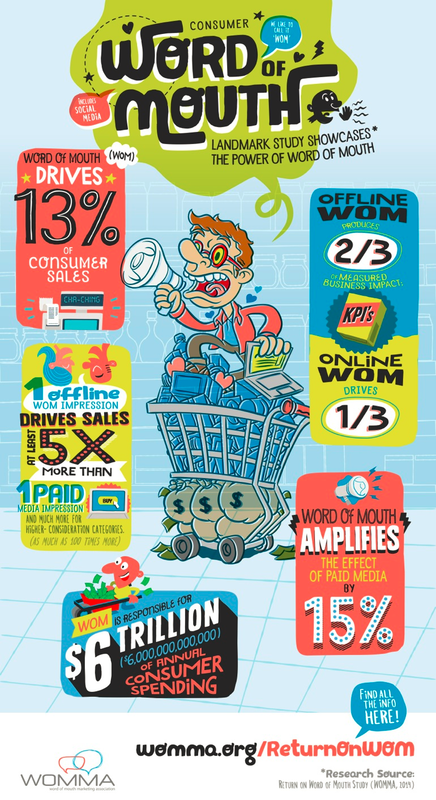 Word of mouth increases the reach and impact of paid advertising by 15%, according to the WOMMA study. Social media amplification is not additive, it’s multiplicative. Do you think word-of-mouth is a complement or an alternative to traditional media? Great to see credit to Robbin Phillips and her wonderful Brains On Fire team! This wasn’t true a few years ago for the first three. How long before online chatter dominates all consumer categories? That’s the direction we’re heading. But offline will stay strong for the foreseeable future. Word of mouth, like commerce, is face to face first.